The deed in question that merited rad Pinky these edible trinkets: she designed the logo from the kindness of her heart and the talent of her, uh, hands I guess, for the Wounded Gazelles team, who are doing the Round the Bays race later this month and raising money for the Casper organisation. I know a lot of dear-to-me people in this team, but also wouldn’t run ever unless like, it was towards Lucy Liu in a kind of slow-motion-high-emotion scene at an airport to try to stop her leaving town. Otherwise, I do not run. Not for money, certainly not for love – a combination of remembering embarrassment and panic attacks in PE class and sports days at primary school, plus too many vexingly bouncy body parts, plus zero interest. What I can do though, is let you know that Casper is a really important organisation, and that the Wounded Gazelles have so many cool people on their team and if you want to pledge a little money, or buy a branded tshirt, tote, or singlet, why, it’s not that difficult. They’ve raised a thousand dollars so far from so many kind people. Also, I am a literal hero, because I made these cookies and blogged about them. Um, but really, I adore Pinky’s work (ocular proof: one of her insolent pink cat prints is on my wall) and it’s so great that she donated her skills to make the super-endearing logo for the Wounded Gazelles. Check out her shop! Admittedly I initially was going to make some kind of fall-back chocolate chip cookie type thing, but then I thought damn it, this deserves something special. I thought: I’m going to make some Internet Cookies. The type that appears on pinterest and is named something incoherently noun-heavy, as if someone just opened up their pantry and threw darts at things and then put all of those in a recipe together. Chocolate peanut butter brownie stuffed waffles with snickers cronut frosting. Cake batter donut cake donuts cake pops. Or something. 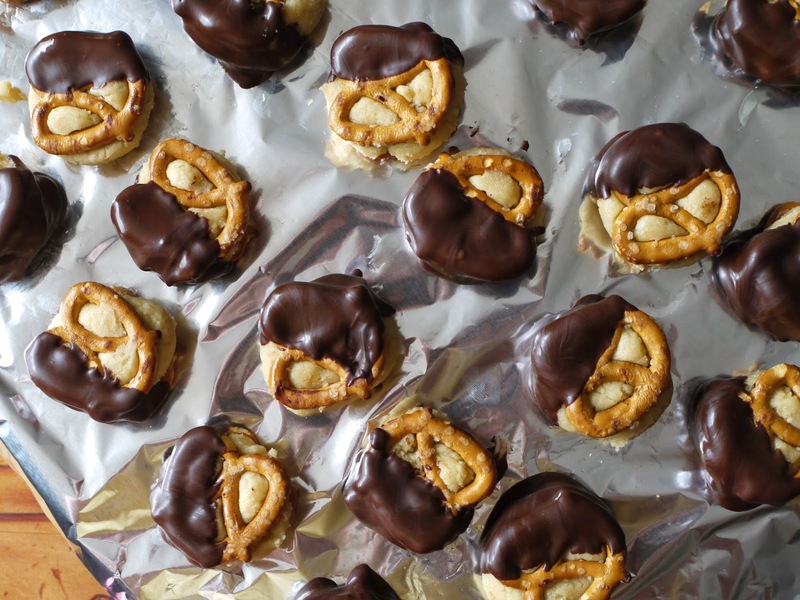 These, though, these cookie dough chocolate pretzel things, are quite coherent. And coherently delicious, importantly. They’re oddly not too sweet, being more about texture than merely exfoliating your lungs with three kinds of sugar. The crack of the chocolate coating, the crunch of the pretzels, the bulge of cookie dough, the roar of the crowd. 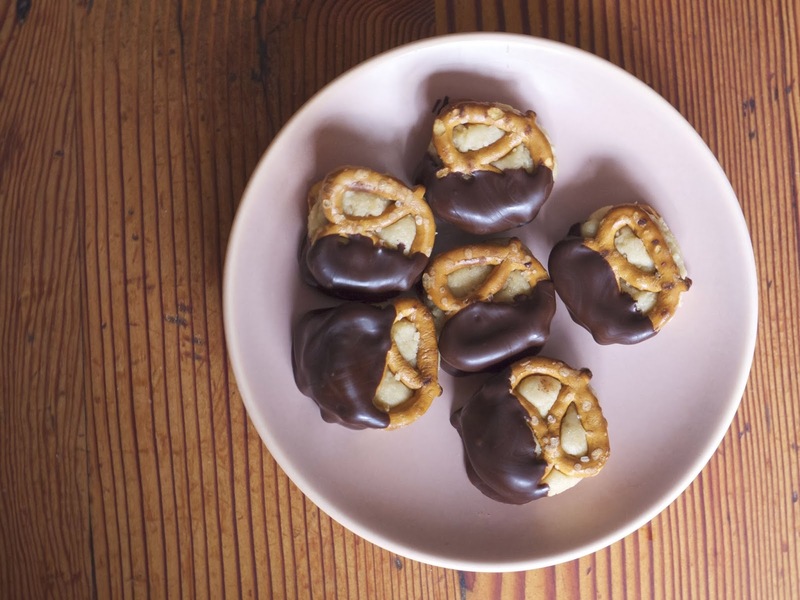 They are also strangely easy – the dough comes together in minutes, they sandwich easily, and then all you have to do is chill them and then half-assedly dip them in chocolate. I know we don’t quite have the same tradition of eating cookie dough here in New Zealand as America does – more’s the pity – but like, it’s the same ingredients that are in actual cookies, so no need to get nervous. And more objectively, there’s no egg in the recipe. 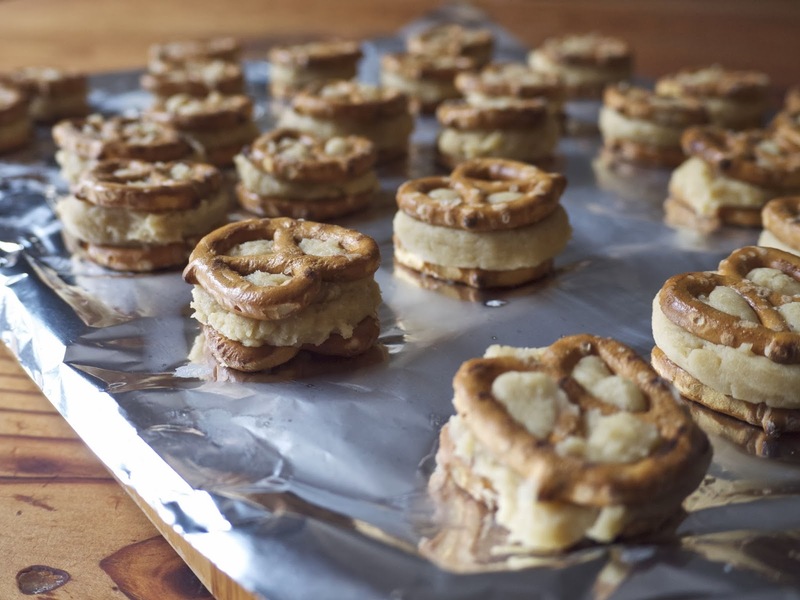 I guess putting pretzels in sweet things isn’t quite as well-known here either but we should really get used to it because it’s the best. Thanks, America! Inspired by this recipe. However, maybe don’t actually click through if you don’t like words like “sinful” used to describe your completely non-sinful food that you’re eating because you want to eat it. soften the butter, and beat together with the brown sugar. Tip in the flour and mix into something that looks like cookie dough – since that’s what it is – and add a little milk as you see fit to make it something that can be easily rolled into balls. Not too soft, not too not-soft, just feel your way. Roll a very small ball of the dough with your hands, and sandwich it between two pretzels, squashing it down a little so the dough bulges out through the pretzel holes. Continue with the rest of the dough until it’s finished (or you run out of pretzels) and chill them thoroughly in the fridge for at least half an hour. 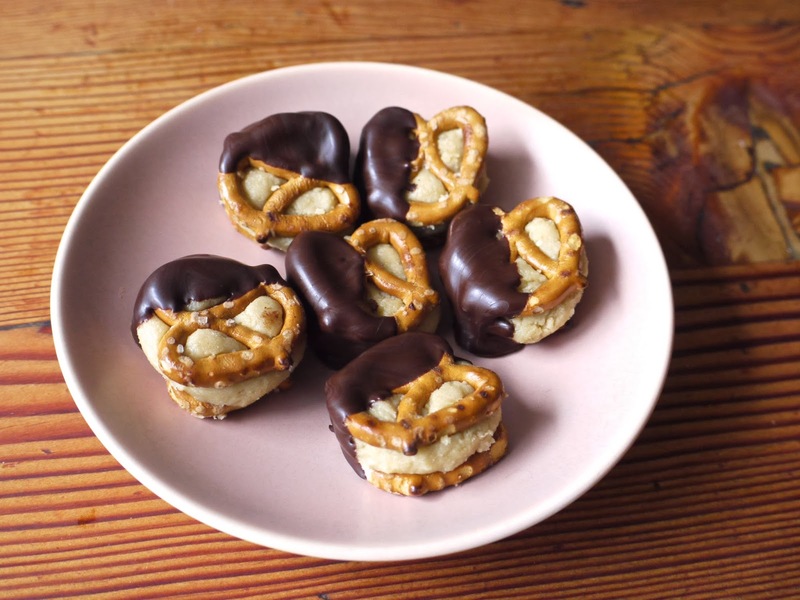 Melt the chocolate and dip the pretzel sandwiches so they’re halfway covered, and then chill them again till you’re ready to eat them. I…haven’t actually given these away yet. But I’ve only eaten one. They’re stupidly delicious and I couldn’t exactly blog about them without trying them. But your stash is intact, Pinky, I promise. title from: um, I guess I’m not quite on-theme here but any chance to be like, “hey! look at my idol Idina Menzel! And can we talk about Wicked?” so here she is singing No Good Deed in her role of Elphaba, Wicked Witch of the West. Lana del Rey, Born to Die. Sometimes I’m just in a Lana-del-Rey-singing-sad-songs-mood. The Breeders, Saints. Ughhhhhh so cool. Selena, Bidi Bidi Bom Bom. Jennifer Lopez was exquisite in the biopic about this tragically killed, amazing singer (I told you I’d been watching sad movies) but this song is nothing but joy. Next time: I discovered that you can buy candy love hearts in 2kg quantities online so upcoming will probably be recipes like “a bowl of candy love hearts” and also “candy lovehearts, served in clenched handfuls”. These look so good! But sadly I think cookie dough is disgusting unless it is, you know, a cookie. Raw flour is one of the most putrid foodstuffs around and people who put it in delicious ice cream are bad and should feel bad. This is a beautiful comment. +2. Cookie dough is one of the best things in this world. Aside from you, if I've read your post correctly;) Anyway but cookie dough, did I mention how it's so awesome? Raw eggs couldn't stop me, I might just throw some in to this for fun. Why not?? HI PINKY! I feel like I know you by now.